On Sunday afternoon, a field of 15 Canadian-foaled 3-year-olds raced 1 1/4 miles over the Polytrack at Woodbine in the 155th running of the $1 million Queen's Plate Stakes, the oldest continuously-run stakes race in North America and the first leg of the Canadian Triple Crown. Conditions were excellent, with mostly sunny skies, temperatures in the low 80's, and a consistent breeze. As expected, Spiral Stakes (G3) and Plate Trial Stakes winner We Miss Artie was sent off as the 2-1 favorite, despite finishing 10th in the Kentucky Derby (G1). 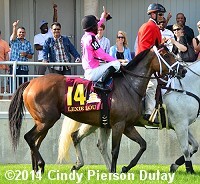 In to challenge him included 3-1 second choice Lexie Lou, the only filly in the field, winner of the Woodbine Oaks, and 7-1 third choice Matador, a runaway winner in an allowance after finishing 7th in the Derby Trial (G3). 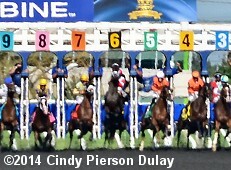 Down the stretch with Lexie Lou closing down the center and Ami's Holiday on the rail. At the break, favorite We Miss Artie with jockey Javier Castellano reared up and was last getting away from the gate, as jockey Chantal Sutherland-Kruse sent 8-1 fifth choice Asserting Bear to the lead first time past the packed stands. Asserting Bear set fractions of 23.23, 47.09, and 1:11.54 over the fast Polytrack while pressed by 29-1 Coltimus Prime and 60-1 Cap In Hand. On the far turn, Asserting Bear continued to lead, getting 1 mile in 1:36.88, as Patrick Husbands aboard Lexie Lou circled the field from 9th early. Lexie Lou took over the lead at the 3/16 pole and easily held off late-running 10-1 Ami's Holiday to win by 1 1/2 lengths in 2:03.94. It was another 1 1/2 lengths back to pacesetter Asserting Bear third, and a long 5 3/4 more to favorite We Miss Artie fourth. Check out the three other stakes on the card: the Highlander Stakes (G3) won by Something Extra, the Singspiel Stakes (G3) won by Aldous Snow, and the Dance Smartly Stakes (G2) won by Overheard. 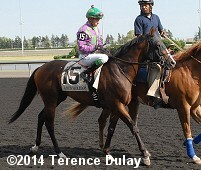 Left: Lexie Lou heads to the winner's circle. Winning trainer Mark Casse, celebrating his first Plate win said, "I don't think I believe it quite yet. It was thrilling. It was really nice to have my family here. My son Colby started crying afterwards, and caused me to cry. It's a great day. I was as confident as you can be. But there are so many things that have to go right. And there are so many things that can go wrong. But we were fairly confident. 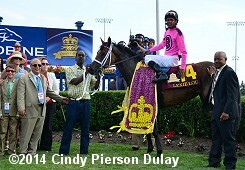 We'll see (about the Prince of Wales Stakes on July 29). It's a possibility." 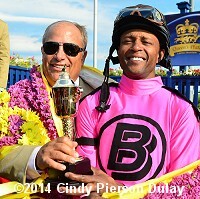 Right: Trainer Mark Casse and jockey Patrick Husbands pose with the trophy. Left: Lexie Lou parades for the fans after the race. Winning jockey Patrick Husbands, celebrating his second Plate win (after Triple Crown winner Wando in 2003) said, "I called everybody in Barbados on Saturday to say I was coming home to celebrate the Queen's Plate. Everybody left (the gate) running. My filly was so relaxed. I had so much confidence in her going into this race. I begged Mark at the (post position) draw, I just want the outside. I tried to get first run on (Ami's Holiday). 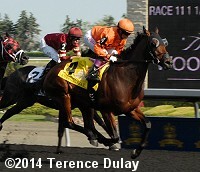 It's an honour and a pleasure to ride for these connections and Mark, I win the Queen's Plate for you." 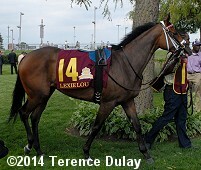 Right: Lexie Lou in the paddock. 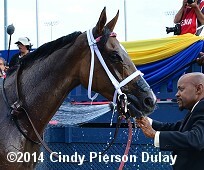 Left: Lexie Lou gets hosed off after the race. 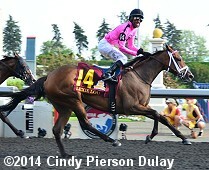 She was purchased privately by Casse and Gary Barber after she finished fourth in the Star Shoot Stakes on April 19. 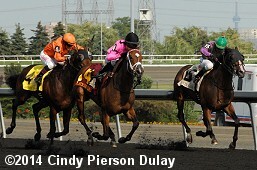 After a close third in the Fury Stakes, Casse removed her blinkers for the Woodbine Oaks where she romped by 4 1/2 lengths. After winning the Plate, the daughter of Sligo Bay out of the In Excess mare Oneexcessivenite improved her record to 5 wins, 2 seconds, and 2 thirds in 12 starts, earning $1,172,658. Right: Lexie Lou back in 9th first time by. Left: Second place finisher Ami's Holiday in the post parade. 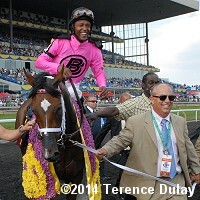 Jockey Luis Contreras said, "I had a perfect trip, it couldn't have been any better. We didn't need to be on the lead and I could see all of the horses from the outside position (15). My horse gave a tremendous kick and we almost got there. (Lexie Lou is) amazing. The five pounds less (weight) might have helped her, but that's racing." Right: Third place finisher Asserting Bear leads first time by. 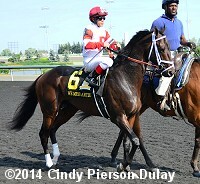 Jockey Chantal Sutherland-Kruse said, "I had a good trip. We had the odd horse come at us (early in the race) and use you up a little when you don't want to, but he was pretty amazing. When the inside horse came up to me at the 1/4 pole he was willing to fight and he fought as hard as he could against Lexie Lou. We did our best today but Lexie Lou was just powerful." Left: Fourth place finisher and beaten favorite We Miss Artie in the post parade. Right: We Miss Artie reared at the start and broke badly. 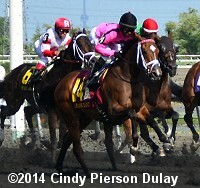 Jockey Javier Castellano said, "We had a poor start from the gate. My horse was in the right position to go, but unfortunately he broke straight in the air and I lost the entire race as soon as they opened the gate. It was hard to make up ground as the track played speed all day long. With the big field, my horse got a little nervous in the gate. He completely sat down behind the gate. That's why he broke straight in the air. It took a lot out of him. He was too far behind, I lost a lot of ground going around horses."